RECENT NOTE FROM THE KIND PUBLISHER OF THIS BOOK! 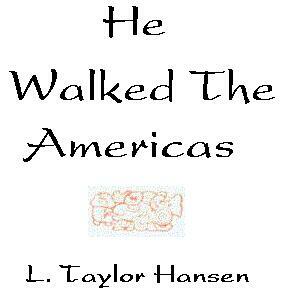 I am the publisher of The book "He Walked theAmericas" by L. Taylor Hansen. I see that you have this book reproduced on your web site. This is a copyrighted book and even though I appreciate exposure for the book, I would like to have it known that I am the publisher of the book and that it is still available for $18.95 plus $4.00 shipping. I have published this book since 1962 and to continue to publish it takes money and even though I have given many away free. I still need to sell copies to continue to publish. If you want to sell this book yourself. I do offer discounts to sellers and this could help pay your expenses. There are a lot of legends that tell of a "prophet" that taught throughout the continents of North and South America. I am just relaying some of those here. Please keep in mind this book was written in 50's and early 60's The bluelettering shows where I have quoted directly from the book. "We are the Ancients, and our skin is red: with us, the Sacred Color. These are our legends told about the campfires on winter's evenings. When you string them togeher, remember our great pride. Now we are looking down and our feathers are drooping. Tell the legends so that our young men will realize that the ancestor threads run in many directions. Through the tribes we have captured and with whom we have intermarried there is a red thread which runs back to the Red Land long sunken in the Destruction. There is a thread which runs far to the south where the mountain tops touch the sky and the Thunder Bird moves through the lightnings. There is a golden thread which touches Tollan, The Mighty, and beautiful Tula, while through some of our mothers there is a white thread to the words of The Prophet. Tell my young men to listen." --Asa Delugie, War Chief of the Mescallero Apaches. "This is our book. May you write it in beauty as we have told it in beauty." --Zeahley Tso, Chief of the Navajo. "There is evidence that some of our ancestors may have come from the ancient trading empire of ChanChan centuries before the rise of the Incan Power in Peru. Tell my people to learn of this great power which once ruled eyes. Tell them to look up and learn." --So-Sah-kuku, Chief Snake Priest of Oraibi. "This is our book-these legends of Ancient times. They are of the blood which courses through our veins. We of the Seven Tribes of the Black Tortoise once had a Dream of Empire. Yet farther back through the cycles of Time we knew the Great Wakon-Tah, but we forgot His words. These legends should help us to look up and remember." --Shooting Star, of the Hunkpapa Sioux. The legends that follow are the legends of the Healer. These legends were told by the fireside of a "saintly white teacher," who performed miracles with healing and control over the winds, waters, and other natural items. All describe his eyes as grey-green like the ocean and told stories of the future. His symbol has been woven into blankets, carved on canyon walls, put on pottery and danced in dances. His name has been given to mountains and rivers. Though the stories are many and spread throughout the Americas, they are broken into bits and pieces, hard to follow and piece together into one tale. His name varied, most names were reflective of his control over the wind and water, as he would request each tribe to name Him as they wished, stating there was no value to a name. The information I give here is just to let you see the legends for yourself. To determine within yourself if this prophet was actually Jesus, or some other. Is there where Jesus was going when He talked about going to other sheep? He stated in John 10:16 (NIV) to his disciples, "I have other sheep that are not of this sheep pen. I must bring them also. They too will listen to my voice, and there shall be one flock and one shepherd." *In Etowa, Georgia, the Prophet began to mention the future after a rite of dedication (known today as Thanksgiving). His first prophecy was concerning the Puan people moving northward and a civil war taking place amongst them. His second was as thus, "Farther off there is another invasion. In ships many bearded men are coming from across the Sunrise Ocean. Many are the ships as the snowflakes of winter. I see these men taking the Broad Land; and the Mounds which hold the cests of our cities are for them, alas!, but earth for the taking. They do not respect our trees of cedar. They are but hungry, unenlightened children, and with them the vision closes....Would that I could speak to those bearded farmers! I have tried. They do not hear me. They go on their way like spoiled children, while I return to you and the present here at the Temple at Eseecowah." At the time of the writing of this book the author stated there were many tribes now in Oklahoma that still remember this prediction, including the Choctaw, Cherokee, Chickasaw and Creek. *The Shawnee told the author that this came from the Prophet...."Do not kill or injure your neighbor, for it is not he that you injure; you injure yourself. Do good to him, thus adding to his days of happiness even as you then add to your own. Do not wrong or hate your neighbor; for it not he that you wrong: you wrong yourself. Rather love him, for the Great Spirit loves him, even as He loves you." *I have heard the Cherokee story a couple times now about when the Prophet was with them. It was said that there were many tales, but most were as all the other nations. The one that was unique to the Cherokee was one in which the Healer was troubled by the events of the future. His twelve disciples (all tribes say he chose twelve for his special training!) were following him through the woods for fear any danger would come upon Him. At one point, the Healer came across a fawn that was lost in the woods. The Healer asked him where his mother was? The fawn turned his head and looked down a path. Not far away was the mother, the victim of a huge cat. She had given her life to save her young. The Healer knelt down beside the dead mother and started stroking the body. As His hand passed over the wounds, they healed up, leaving no marks. The deer then started breathing and rose. The disciples were upset at this and asked Him why he was wasting His energy on the animals. The Pale One said, "There cannot be too many good deeds. Such is the manner of compassion. A lost lamb is my Father's business, as important as saving a nation, if one need not choose between them. More precious in my Father's eyes is a good deed than the most exquisite jewel." *The Prophet was known to come across a Puant city in the now known area of Oklahoma. It was the Prophet's custom to always take their established temples and change them. He would chose the twelve to teach them the priesthood and then lectured the people. This was again done here as usual. But here, the people wanted to hear about his childhood. He told them he was born across the ocean where all men had beards. Even in the legends, he told them of his virgin birth and about the bright star that shone over his city of his birth. The heavens opened up and winged beings sang chants of exquisite beauty. When the University of Oklahoma was digging the Spiro Mound, they found mush pottery showing winged beings singing, and also the hand with the cross through the palm. To them, He was known as Chee-Zoos, the Dawn God, and they whisper of Him about the campfires when no white man can listen. To quote the book, "The love they bear Him is beyond measurement, for well they know He watches over them, and that when their journey here is over, He will meet them in the Land of Shadows, for such was His sacred promise. They smoke the Sacred Peace Pipe in His memory, and blow the smoke to the four directions, knowing that to each man comes his retribution, no matter how flows the river of history. Thus in great pride walks the Red Man, even though now dire poverty stalks him and starvation or hunger sits at his table. In the masklike calm of his expression there smiles a secret satisfaction, a something which to puzzled white men is entirely beyond understanding." *An interesting story told in the book is about the Great Mound Builders, Decoodah (the last high priest of extinct Elks, translated and recorded by Walter Pidgeon around 1850) described them as tribes that spoke the Algonquin language and they were the Ancients of the country. According to him, these mounds marked the sites of cities. They were a type of writing that recorded history. They were to be read from the inside out and one had a history longer than London. The mounds were thought to have been covered by wood and painted as the Mayans had done. It was here too that the Prophet with his grey-green eyes and golden sandals came. They tell He was the "Great White Robed Master." In the Spiro Mound in Oklahoma, they found the symbol of the hand with the "T" cross through its center. As aforementioned, this is where they found the pottery with the winged beings. In the Indian Mound of Pittsfield was found three pages of parchment, and according to the author, they are in "old Harvard." One these pages were supposed to be quotations, written in Archaic Hebrew, from the Old Testament. About 8 miles southeas of Newark, the father of Bancroft, the Native American recorder of untold legends, claimed to have the only stone pictograph of the Prophet. About His head, again in ancient Hebrew were written the Ten Commandments. Quoting the author...."His hair and beard are well pictured as well as His flowing toga. It was a small stone, highly polished, an inch and a half thick, eight inches long, four inches on one end to three on the other. This had been placed in a casket completely watertight, andn many feet above it was the burial of the Indian high priest. How many other mounds have been plowed and leveled, and their contents scattered which the Red Men held as holy, planting trees of the sacred cedar upon them to keep them safe through two millenia? True, the invasion of the Serpents from perhaps 700 AD onward, coming up the Mississippi in their long snake-painted dugouts, carrying their sacred fire, brought an end to peaceful living, brought with them war and pillage and the priesthood of the Sacrificers. Yet they turned away from the hills of cedar, seeing the symbols of the Healer." *The Pawnee tell of a Prophet who taught them of His Father, "The Mighty Holy of the Heavens." He warned them not to forget what they were taught by Him, and when they would return to warfare, they often thought about how He taught them that "war but breeds more carnage." He had also told them about the white men coming. They remember Him as Paruxti and His Father was Tirawa. The Pawnee claim the Prophet visited them twice, the second time was out of anger. As the story goes, some young men of the Pawnee had gotten together a secret league to attack merchants and make "war" on them. One night the Pawnee was by the Mississippi River and came across a camp of worn out merchants. The merchants had not been aware these young Pawnees had returned to the old ways and thought they were safe. One of the young merchants had stated that he was sad he never got to see the Dawn God. But they smoked the Peace Pipe and went to sleep. The wild Pawnee then attacked, forced the merchants to carry their own goods back to the bandits' camp. They had a wild night, dancing, yelling and preparing the two men for a sacrifice to the Fire god. One old man protested, pointed to the east where the Morning Star was beginning to rise. But no one paid attention to him and carried on what they were doing. One of the prisoners was already dead and the other was dying. The Pawnee stated, "Let Him come and revive these men! That would be much better magic than stopping a wind storm or walking on water!" At the point, the eastern sky lit up with fire, clouds reflecting the fire ever brighter. Everyone turned toward the brightened sky and stopped in their tracks. Suddenly there He was among them! They say He shined with a strange radiance, each hair of His head luminescent, a weird glow rippling from His garments and His sea-colored eyes flashing with lightning. He stood staring at the wild Pawnees. He asked them if this was how they kept His commandments, insulting the Father. "I came to shield you from His anger, or lo, great wind would ignite the forest! And to ashes would be consigned the Pawnee Nation!" At this point, the prisoner that was still alive called to Chee-Zoos and asked to be released. The Healer told the man he was free and to walk from the fire. Those who were watching saw the man stumble toward the Healer. When he had touched the Healer's robe, the man straightened up and didn't have a mark on him from the fire. The Healer turned to the dead man, telling him that he wasn't yet for the Land of the Shadows. The fire died away and the blackened body stirred. The Healer told him to rise up. The man rose up and was completely healed. This story is still told sometimes by the elders at the fireside during the winter evenings. *The "Algonquin of the Eastern Seaboard" tell they received their name for the Dawn Light from the Pale One. They wouldn't name the Prophet as He had asked them to do. They wanted to know what He was called where He grew up and He told them a name that was strange and hard to say. But they tried hard to say it: Chee-Zoos, God of the Dawn Light, basically the same as the Puants. *The Chippewa remember very well the "pale Great Master." They tell He gave them medicine lodges where the signs and emblems are secret and taken from those across the ocean. And according to the author, they keep this secret to this day. *In the times of the Prophet, the place which is now St Louis was once the capital of the Puant nation. The streets of the city actually represented history. Each street started from the Central Hub (which is where the Crest mounds were) and grew outward like a spoke on a wheel. When a dynasty was complete, the line would end and pottery with significant pictures of the period would be placed within the mound. The crest would be closed with a Mound of Extinction. Beyond it, counterclockwise, the new crest would begin. The capitol buildings stood on the old crest, usually built of logs and beautifully painted. Many crests had been closed at the time of the Prophet and the city was large and many imports and exports went through the streets. The Algonquin remember Him well at the time of His arrival. The fleets coming down the river ceremoniously brought Him, always greeted with flowers. Once the Prophet heard tales of the Sunrise Ocean and the Five Tribes of Warring Nations. He wanted to go see them immediately, He was so opposed to war and left with the merchants. He came upon the Senecas and called the chiefs into a council. Quoting....."Long He spoke to them on the ways of His Father, as He had throughout the Broad Land, handling the language with great ease. He explained His peace religion, then He asked of them quite simply: what was the reason for their warfare? The Fire Chieftains were embarrassed, for they had long forgotten the reason, if indeed they ever had a reason. Each warrior looked upon the other and none could think of a valid answer. "Therefore He bound them ceremonially into a never-ending alliance. To each He gave a sacred duty to perform for the alliance, and then He asked them to smoke the Peace Pipe, filled with tobacco and cedar shavings, and to blow the smoke to the four directions making the sign of the Great Cross, which is a holy symbol. Never from that time onward have the Five Nations fought each other, nor has the trust He gave them been cracked and broken. "At this Council was a Seneca chieftain who was tall, for we are a tall nation. Like many of our people he had a lofty stature, and could easily look down on the heads of the others. Indeed the Prophet was not a short man, but neither was He as tall as the chieftain. The Seneca, seeing that he was the tallest, and could look over the light hair of the Pale God, rose and waited to speak. "There was a shocked silence. Would he presume to question the Prophet? The chieftain looked upon the Healer. "During the four days the Healer went among the tribes, and though He did not speak of His appointment, everyone knew that He would keep it, for the Great One never broke a promise. Accordingly, at the time appointed, great crowds swarmed about the small mound where the Great Lodge stood open to the eastward. First to climb the mound was the Prophet. As over the horizon arose the first golden shafts of the Dawn Star, the Pale God spoke to the assembled nations. It is said that He always charmed His listeners, but now there was almost a breathless silence. Indeed it seemed the very trees were listening and also the assembled animals of the forest, so softly He spoke and so well did they hear Him, because of the silence that had settled. "Now the tall chieftain left the others and slowly climbed the small mound, taking his place beside the Prophet. The two eagle feathers in the hair of the chieftain projected well above the head of the Healer, but no sign except a friendly greeting was given by the Pale Heawahsah, who turned and began the Chant of the Dawning. This was a prayer chant He had taught the people, which has long since been forgotten. Everyone started to join in and then, suddenly, a miracle happened. "The tall chieftain, seeing the Great One clothed in gold light, knelt in the dust beside Him and taking the hem of the Prophet's mantle, laid his cheek on the line of creases. I know that you think this sounds something like the Legend of Hiawatha written down by Longfellow, the poet. You are right; there is a resemblance. Once he was our guest and heard us chanting. He liked our stories so well that he kept urging us onward through his interpreter of the language. We told him many stories. When he returned and began to write them, he mixed them all together; but he was not trying to make fun of our legends-he was confused. We still honor him for enjoying the chants, and even trying to get the rhythm of their language. We honor him although Heawahsah never sought a Dacotah maiden. That was a much later hero, who married with a distant nation. "The meaning of Heawahsah? It is He From Afar Off. It is our name for the Prophet, who drew His great strength from the Dawn Star. All nations know He was of the Dawn Star, and that is why, even now, no nation of the ancient people know as 'red-skins' will ever make war or fight a battle while the Sacred Star of Peace is still shining in the great heavens. They dare not, for it is the Star of the Prophet." *In Michigan, according to Decoodah, was the center of the Giant Cross of Waters. The Prophet was known to travel this trail. No tribe was too far, too small, too poor, too war-like. If He heard of a war, He went there. He would call all the chiefs together, divide the lands, give seeds and show how them how to garden. He would teach them His principles. "Do not kill unless you are hungry, and then ask the animal's forgiveness, and explain your great need to him before ever you pull the bow-string." This was one rule that Native Americans ever violated. Before hunting, each tribe would hold a prayer-dance. He was always called the Feathered Serpent or Eeseecotl among the Algonquins. They tell that He always wore a long white toga, with black crosses embroidered along the bottom, and had golden sandals. Every new town He would arrive in would have a new garment waiting for Him. They would keep the old ones, treasuring them, saying that to touch them would bring healing. During the visits He would train twelve disciples, with one to be their leader, who would take His place when He left to "go about My Father's Business." After He would leave, the grieving people would carve His sign upon the walls of canyons-a hand with a T cross in it. *While visiting the Chinooks, the Prophet pointed to a plain laying below them, stating that He saw through the cycles of time a great city spread across this plain, named Tacomah. It was to be a white man's city. The Chinooks were confused as to why the white man would name a city after Him, Tla-acomah. He explained that they would use the name of the mountain named after Him, but they would not understand the meaning of the name. *It is said the hot springs of Tacobya mark the passage of the Healer. In a canyon nearby is the hand with the T cross in it, and near this the Great Cross. It is understood that He traveled to the Havasu, raising one arm in greeting meaning "Peace and Prosperity to you". He then stopped and tapped a large rock with his staff and water gushed out of it. He drank from this sacred water and today it is called the Spring of Tacobya. *Tacobya went on to the Pueblos where the Empire of Tula, the capital of the peaceful Toltecs. He also went to the Wallapai tribe and gathered the chiefs in a great counsel and redistributed the grainfields. He taught them more clever gardening with melons, squashes, pumpkins, mescal, and beans; he gave them many other plants which have been lost through the ages. He also taught them how to conserve water under the ground. *He went on to the people of the White Rock. They told Him they had come here after a great war in the south. Their cities had been burnt and they were all that was left of the once great power. They were sad in their hearts and the Prophet told them of another nation that had to flee oppression in days long gone. Then He showed them the beauty of their land and taught them how to garden well. As He was leaving the Pueblos, He told them, "In truth I give to you a promise. Keep you my precepts, forsake all warfare and you shall ever have my blessing even beyond White Man's coming, and woe to the hands that are raised against you...If to my teaching you are faithful, and to show that you have lived each day rightly, leave alight at night burning against the time I will return through the Dawn Light, and lead thee unto My Father's Kingdom." So every night a light is burning in Acoma and other Pueblos among these tribes which we call heathen. From there He moved on.